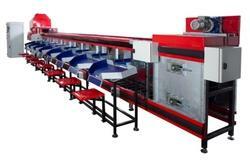 Providing you the best range of fruits and vegetables grading line with effective & timely delivery. Backed ourselves with sound amenities and talented personnel, we have emerged as one of the leading manufacturer, exporter, importer & supplier of superior quality Fruits and Vegetables Grading Line. These are suitable for fruits and vegetables of all size, colour and weight. Our entire range is manufactured, keeping in mind the latest market trends using optimum quality raw material and cutting-edge technology, in line with set industry standards. The offered range is well-known in the market for their high utility features.